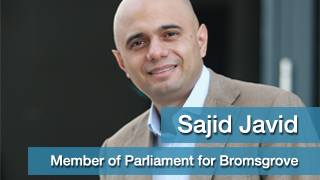 Born in England, Sajid Javid joined the Conservative Party in 1988 and has been an active volunteer since. After serving as VP of Chase Manhattan Bank, he was later recruited by Deutsche Bank in London. He left as a senior Managing Director in the summer of 2009 to give something back through politics. He is a specialist in helping to raise investment in developing countries and is considered a global leader in this field. He has been engaged in community work his entire adult life.